The growth and expansion of Hawassa city is considered to be radical when compared to every town in the country; it happened within a short period of time. Particularly since the 1980s Hawassa had shown a very fast growth.The natural factors include accessibility, climate, vegetation, water supplies, soil etc, while the social factors include defense, administration, economy, the political system and other conditions. Thus Growth and development of Hawassa is the result of various factors combined together. The Arsi Oromo and Sidama pastoralists used to camp around lake Hawassa searching for a grazing field and water for the their cattle. In earlier times, traders from the central country also built camps around the ceramic factory. Besides, the government settled 404 retired defense military groups along with their families in the town. These were the first official settlers of the city. The establishment of health centers, schools, various religious institutions, the establishment of large sized state farm, community development centers, agricultural farming and training centre, Wanza Wood processing industry, different processing factories and other developments eventually led to a great settlement in the city; which again led to the growth and expansion of the city. 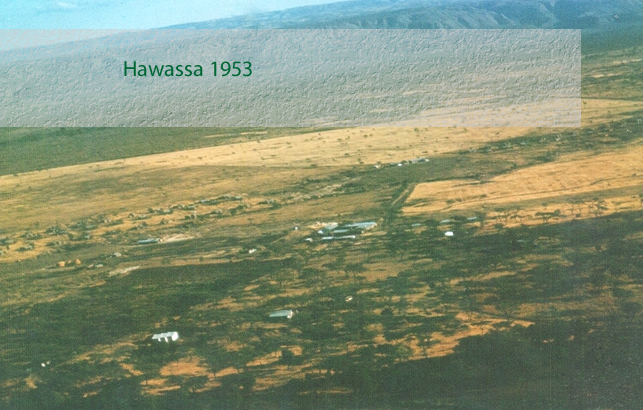 According to yearly magazine of Hawassa municipality in 1967, the transfer of Abella woreda governorate to Hawassa was finalized at the early stage of the city. Prince Ras Mengesha Seyoum the governor of ‘’Sidama province’’ ordered the transference of the Woreda (district) office from Abella to Hawassa in 1966. The first building of the worded office was built at the place where Hawassa zuria Wereda police station is found presently, just at the back of Taddese Enjory Hotel. The king also gave an order, which allowed foreigners to own land and construct their own houses in Hawassa.As a result higher officials and other dwellers started constructing beautiful villas near and around the lake. These include ‘Villa Alpha’ of the most Honorable World Maitre Artiste Laureate Afework Tekle, just at the gate of Lewi Resort. Shortly after Hawassa was upgraded to woreda level; the district (Abela woreda) governorate office police station, the judiciary and the treasury came in the being. All these including the main open market were clustered together in an office at the present site of Hawassa zuria Woreda police station.In 1975 Emperor Haileselassie, laid the foundation stone for the promotion of Awassa as the foundation stone for the promotion of Awassa as the capital of ‘’Sidamo’’ Governorate General at the present Meskel square. Immediately after the town was promoted to capital of Sidamo Governorate, the main office, police station, the jail, treasury and other governmental departments were brought to Hawassa. The first office of Sidamo governorate General in Hawassa was on Mr. Martini’s building near to the area of Oasis (WabiShebele Hotel No.2). Then, it was transferred to its own building located in front of Meskel square where the offices of the regional president presently exist. Hawassa’s role as a political and administrative centre continued up to the upcoming government reforms and changes. This and other progressive tasks changes that had been taking place at the city including the drafts of its master plan (May, 1981 and 2008), led to a rapid population growth and expansion of residential areas these are also the consequences of the promotion of the town as a political and administrative center. The city has been serving as a capital city of Southern Nation Nationalities and peoples Regional state, Sidama zone Administration as well as Hawassa city Administration since 2004. It was by the constitution of Southern Nations, Nationalities, and people’s RegionalState proclamation that Hawassa was stated as the seat of the regional state. Copyright © 2014, Meleket Information Promotion and Advertising. All Rights Reserved.